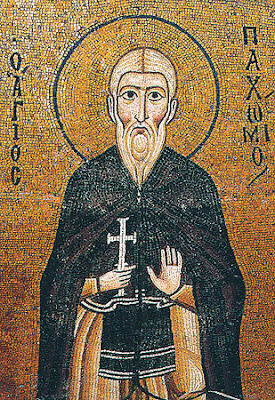 Our Holy Father Pachomios was from Egypt in the Lower Thebaid, and lived during the reign of Constantine the Great (306-337). He was the son of impious parents who venerated idols. Once the Saint went with them to a temple of idols, and he heard the caretaker of the temple say to his parents, as they were offering a sacrifice to the idols: "Lift up the enemy of the idols and be gone from here," which he spoke concerning Pachomios. It appears the demon that dwelt in the temple was frightened of the future virtues of the Saint. For when the Saint drank from the wine offered to the demon, he immediately regurgitated it. When the Saint came of age, he was numbered among the imperial soldiers, and shortly after this he left his military office and went to the Upper Thebaid, where at once he received Holy Baptism. Then he was clothed in the monastic schema, and hastened into the desert. As he was going towards the place called Tabennisi, a heavenly voice came to him revealing that the place in which he was as being suitable to build a monastery, and that he was to gather numerous monks. Thus the Saint established a monastery there. As time passed, many brothers came to the monastery and became monks, among whom was his disciple Theodore the Sanctified, who was a zealous imitator of the life and virtues of Venerable Pachomios. Through passionlessness he was purified to such an extant and attained such a height of theoria, that he was able to see the pure souls of the Saints when they were raised up to heaven, he saw as near those things that took place far off, and foretold in the present what would take place in the future. * Pachomios was abbot to the cenobites for some forty years. 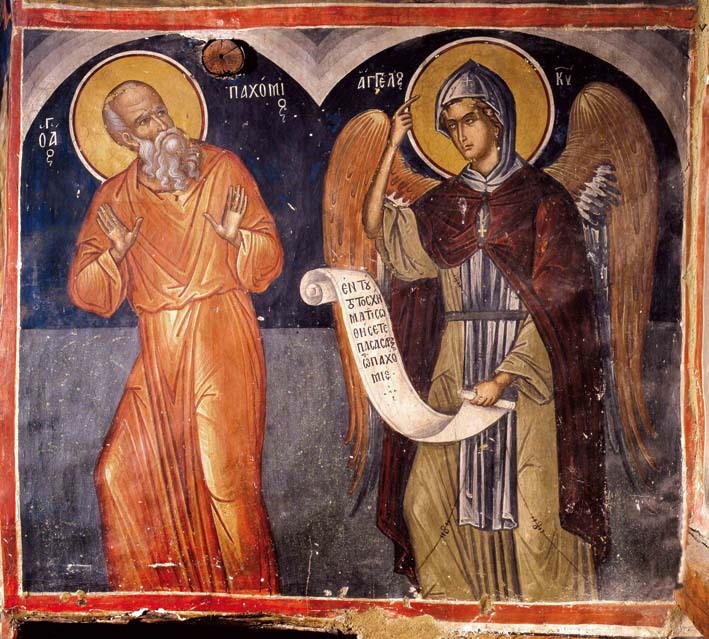 During an epidemic (probably plague), Pachomius called the monks, strengthened their faith, and appointed his successor. 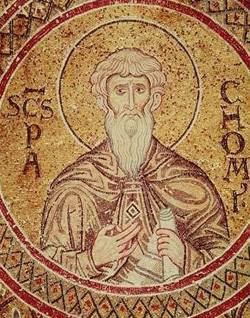 Pachomius then died on 9 May 348 A.D. By the time Pachomios died, eight monasteries and several hundred monks followed his guidance. Within a generation, cenobitic practices spread from Egypt to Palestine and the Judean Desert, Syria, North Africa and eventually Western Europe. The number of monks of his monasteries may have reached 7000. As a pastor of the Chief Shepherd, thou didst guide flocks of monks into the heavenly sheepfold thyself illumined, thou didst instruct others concerning the Habit and Rule. And now thou dost rejoice with them in the heavenly mansions. 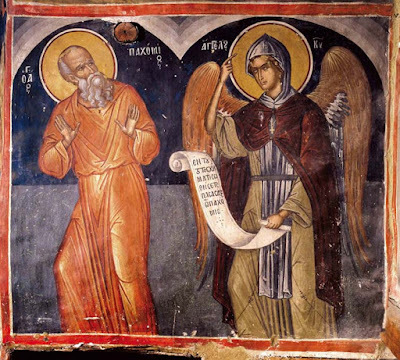 O God-bearing Pachomios, after living the life of Angels in thy body, thou wast granted their glory. Now thou art standing with them before God's throne, and praying that we all may be forgiven.